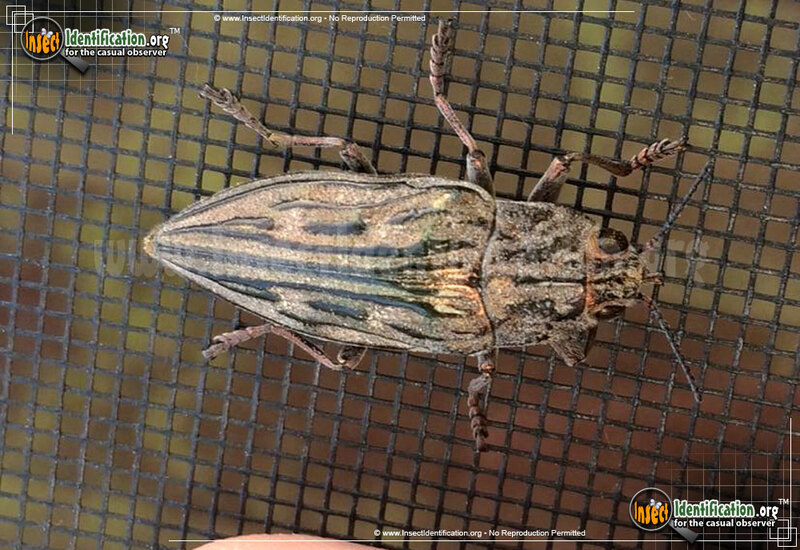 Detailing the physical features, habits, territorial reach and other identifying qualities of the Large Flathead Pine Heartwood Borer Beetle. A flash of metallic colors on the abdomen of the Large Flathead Pine Heartwood Borer can be seen when they take flight. The long common name of this wood borer really describes everything about it. It prefers coniferous forests, particularly pine trees. An adult beetle usually breeds on dead trees and in stumps. Sometimes, however, it breeds in living pines. The larvae of the Large Flathead Pine Heartwood Borer hatch and bore their way through the heartwood of the tree. This tunneling tends to destroy the tree's cambium tissue which is necessary for carrying water and nutrients up and down the trunk. Larval digging activity can actually starve the tree to death if it is infested with enough of them. When the Large Flathead Pine Heartwood Borer adult flies, it reveals a bright abdomen (belly) that has a blue-green metallic sheen to it. This flash of color is not visible when the beetle's wings are closed. They are known to make a noise as they fly, which can help observers locate them if they are in a quiet forest. The brownish-bronze elytra (wing coverings) are marked with black lines, some long and some short, that run down the back. Large black eyes on either side of the head are almost positioned on top. This beetle has a low profile which may make it easier to get through narrow exit holes in tree trunks. The beetle can be found most often in the eastern part of the continent, from Canada to Florida, but its range has spread to any region that grows conifers. This means it can also be found coast-to-coast, even in California and other states not originally thought to be its range.